Be Enchanted’s natural soaps are fantastic if you want to improve your showering experience with some natural ingredients which will leave your skin smooth, moisturised, clean and irritation free. Click here for Be Enchanted’s natural range of soaps, including goat’s milk soaps for you. Our soaps are supplied to us by a local specialised soap manufacturer in Melbourne. These soaps have superior lather and moisturising properties, and its beautiful fragrance will last right down to the end. Due to the presence of moisturiser which is naturally derived from the plant extracts, in the soap range including the goats milk soap, these soaps will not leave your skin dry, itchy, and irritated. So, if you really want to improve your skin condition just browse our catalogue. All of our soap range, including the goats milk soap is available at reasonable prices. With only a natural vegetable oil base, natural plant extracts and essential oils, these soaps are fantastic for people with sensitive skin, dermatitis, psoriasis, eczema and any other skin condition. As there are no harsh chemicals contained in the ingredients like commercial soaps, these soaps are less likely to irritate the skin. Goats Milk soap has had quite a bit of television exposure on Channel 7’s ‘Today Tonight’ and Channel 9’s ‘A Current Affair’ for its great benefits to people who have any skin conditions as the natural components in the Goat’s Milk have many positive benefits and may not only help but also improve the skin condition. Our natural soaps are supplied to us by a local family here in Melbourne. They are a contract soap manufacturer who specialise in natural soaps. They commenced professional soap bar manufacturing in October 1995 and the business is family owned and run. The family continues a proud tradition of producing the world’s finest natural soaps. This is a true plant oil soap made by dedicated artisans with respect for the techniques passed down through the generations. By world standards they are a small boutique manufacturer and this enables them to stay true to their original aim of making the best soap in all respects. This original aim has never been compromised. These soaps are made from sustainable palm oil, water, salt and some varieties may also contain spices, herbs, essential oils and plant extracts. 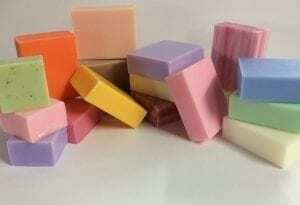 A small range of these soaps include fd&c colours (food, drug & cosmetic grade). The palm oil is sourced from sustainable growers who have converted old rubber tree plantations from decades ago into palm plantations. The palm oil is not sourced from rain forest cleared plantations and poses no threat to the endangered Orangutan population. All of natural soaps bases are made from pure Palm Oil and Palm Kernel Oil. The company source the highest quality soap base available. All of the suppliers are member of the Round Table Of Sustainable Use Of Palm Oil (RSPO) which aims to promote the production, procurement and use of sustainable palm oil. No animals are harmed or endangered using this source. These soaps are not tested on animals. Please note: The information provided on these pages is intended as a guide only. Be Enchanted is not responsible for any consequences resulting from the use or misuse of the information provided. No liability is taken.